The Washington Redskins appear to be sparing no expense for their new stadium. The Washington Redskins, the NFL team of choice for uncles everywhere, are in the process of trying to build a new stadium. For the design of its new home, Washington owner Daniel Snyder chose the Danish architecture firm Bjarke Ingels Group, and the firm is really shooting its shot. 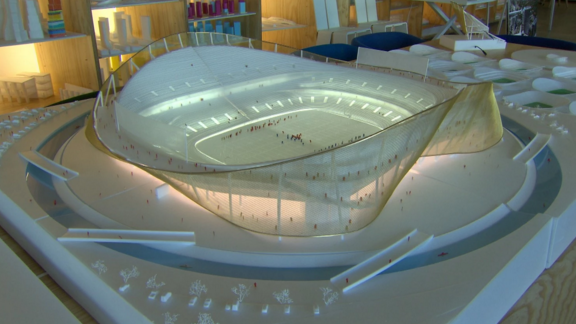 According to The Washington Post, a model of the design presented to 60 Minutes for an upcoming story features a moat around the stadium for kayakers. A moat for kayakers? A moat for kayakers. “Tailgating becomes a picnic in the park,” Bjarke Ingels said of the moat's inclusion. I mean, has this Danish dude ever tailgated before? Has he ever been to a park? What are we doing in America if all these parks in Denmark have moats? Tailgating is already such a production. Pickup trucks with built-in grills and televisions will now have to add floating capabilities or, at the least, easily attachable kayaks. You may be thinking at this point: Say, this sounds fun, why don’t more buildings have moats? Probably because they are highly impractical and an absolute waste of time.